Over the last week, violence in Israel has escalated and resulted in the death of four Israeli citizens, three of them in front of children who are now orphaned because of their parents' tragic murders. I have read, with increasing alarm, the grossly misreported incidents that show not only a shameful anti-Israel bias that express sympathy for the Palestinian terrorists who have shot and stabbed unarmed civilians in a fervor of Jihadist violence and deeply ingrained antisemitism, but shocking ignorance of the context for the ever-present conflict that Israel and the Palestinians seem to be endlessly stuck in. 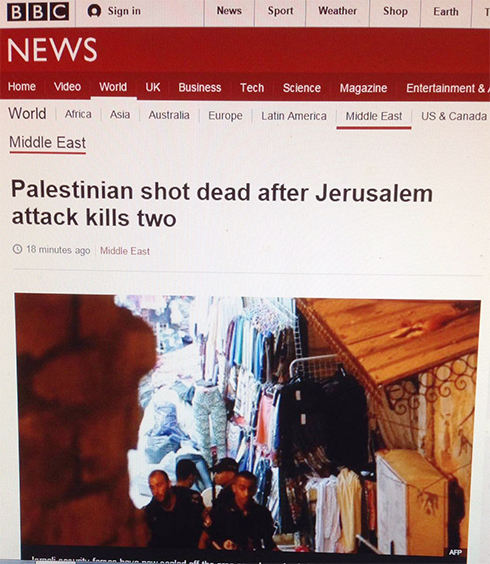 From the BBC to the New York Times, the Palestinian terrorists who have robbed Israeli citizens of their lives and continue to threaten us with more stonings, molotov cocktails, knives, guns and lynchings, have been depicted as victims. Yes, that's an actual headline from the BBC. That Palestinian who was shot dead, stabbed to death Rabbis Aharon Bennett, 22, of Beitar Illit and Nehemia Lavi, 41, of Jerusalem near Lion's Gate in Jerusalem's Old City on Saturday evening. Bennett's wife Odel and their 2-year-old son Natan were also wounded. Odel woke up in a hospital as a widow and her son is now fatherless. Aharon, Odel and Natan were on their way back from praying at the Kotel. Nehemia Lavi was trying to help defend the victims when the attack occurred. The Palestinian that was shot dead was killed by police on the scene in the middle of the attack. Should we let the BBC know that, since they seem to be unaware of what happened? 1. I am doing okay. I am safe, and staying aware of my surroundings wherever I go. I am avoiding the Old City, where some of the murders and attacks have taken place, as much as that deeply saddens me. Usually, I love the Old City and have spent plenty of time there in the past. 2. Please don't worry about me--I have a wonderful network of friends, teachers, colleagues, peers and neighbors who are here for me and are an endless source of wisdom, advice and hope. It's one of the many wonderful things that I love about this country and the people in it. 3. I have lost "friends" in the past for my association with Israel. If your are going to be one of those "friends," I don't really care. However, If you don't believe me when I tell you that I haven't joined a legion of evil in Israel, that we are not an Apartheid state, that we are not killing innocent unarmed Palestinians because we are the new Nazis and we just hate us some Arabs, then please talk to me. I hope I can point you in the direction of honest and unbiased news sources and tell you about my own experiences living here. Maybe we can learn something together instead of perpetuating more misinformation that leads to hostility and hatred. 4. Honest and open conversations take place in Israel, amongst Israelis, Palestinians, Arabs, etc., all the time. There is a wide range of political backgrounds that make up the conversation and debate, from the far left to the far right, and that's exactly how it should be. 5. This is not just about religious tensions. If you think this conflict just boils down to a bunch of religious extremists, both Jewish and Muslim, then you have a lot to learn, my friend. 6. I don't hate Arabs, Muslims, or Palestinians, and I'm not interested in conversations about how evil and terrible you think they are. We are all human, and the moment that I forget that and degrade the conversation to a place of hatred, is the day that I have lost touch with the core of my morals and ethics. You can think what you want--I won't descend into that dark place with you. 7. Similarly, if you think that the blame of this situation all falls onto the shoulders of Israel and her citizens, please educate yourself. I live here now too. My life could just as easily be taken for the fact that I'm here, I'm a Jew, and I'm an Israeli. Your belief in misinformation fuels this conflict further, and it endangers my life, and the life of every person here, Israeli and Palestinian alike. Think about that. 8. If you want to know if I'm a liberal or a conservative, I'll tell you now that I'm neither. I find those labels increasingly useless, divisive, and a misrepresentation of what I feel and think, and ultimately how I choose to live my life. I will read, listen to, and consider conservative and liberal sources alike. The point is to think, not to choose sides in the interest of being "right." 9. Stay hopeful. I know I am. Stay safe, wherever you are in the world, and never forget your humanity.